I’ve been involved since early 2016. I joined in October 2016 as a part of the fall fresh meat class. This will be my third season playing with SRD. Initially I came to Skate it Out to have some fun and learn how to skate. 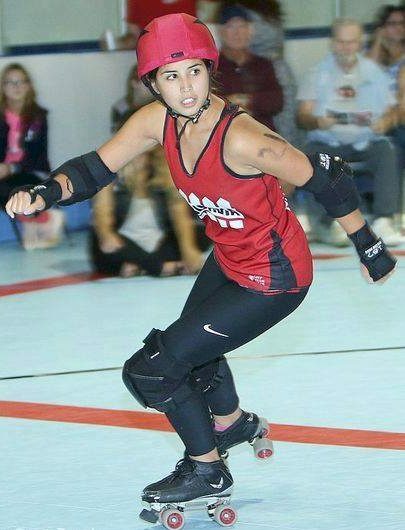 After learning the basics I realized I loved to skate and that it was the perfect jumping off point to roller derby. I think roller derby is one of the most positive things I do in my life. There is always something new to conquer, always endless support from the team and a perfect way to stay active and continuously push myself. Before derby I never played a sport in my life and never felt like I was particularly athletic. So when I see how far I’ve come every hard hit or lead jam feels like a proud moment. I work in packaging design during the week but love to go on food adventures, watch movies, and travel in my spare time. I also have my own etsy shop. I’ve been told I make some mean Rice Krispie treats.